HIGH POINT, NC - Take a close look at the Bolero Collection and you'll see contemporary touches, some Asian influence, even a little Art Deco. Although the sources of inspiration may seem diverse, they're perfectly in step with one another - much like a well-choreographed dance, with beauty and grace. Thus, the name perfectly suits this newest transitional group from Marge Carson. "With so much variety, this group gives us a chance to appeal to many customers by playing with textures and finishes; it's a very rich playground," says Marge Carson owner and CEO Jim LaBarge of this striking bedroom, dining room and occasional collection. "We've taken it several different ways, looking at it from many different perspectives - even introducing a crisp white "Himalaya" finish, and combining warm silvers with cool golds. And, throughout, there are geometric patterns and organic details that, seeing in person, simply stir the emotions." 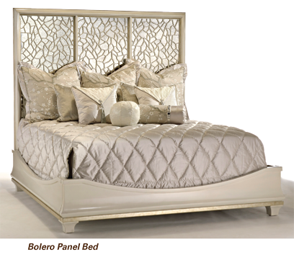 Christine Rendino, who leads Marge Carson's design team, concurs that Bolero has widespread appeal. "Transitional groups have become increasingly popular over the past few years," she says, "and this one beautifully fills a niche in the Marge Carson lineup. It's a little less dressy than the Tango Collection but a little more so than Sonoma." 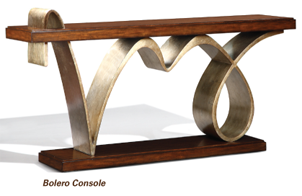 As is the hallmark of Marge Carson, the Bolero Collection features a wide range of striking designs. One of the highlights is an impressive rectangular dining table; with a rich "Bombay" finish, the 98x48-inch extension table features a top with a decorative ogee pattern and an optional polished nickel bar piercing the base. Its counterpart - with a pale gold metal base - is round, its straight-grain ash top measuring 72 or 84 inches in diameter with a honey-colored shell border inlay and ebony trim. And the complementary oval credenza is a work of art in its own right. With an antique mirror, stone or straight-grain ash top, the serving piece is accented by ring hardware that marries cast brass and crystal. Also among the signature pieces of the collection are two magnificent beds. The first, an 80-inch-high panel bed, features a pierced headboard; the cracked ice-like pattern is crafted of wood, overlaid against an antique mirror backdrop or exquisite upholstery. Illustrating the diverse possibilities, Marge Carson is showing one with the pierced overlay in the "Bombay" finish, with burnished silver trim over pale gold silk upholstery. The other is being shown in the new glossy white "Himalaya" finish, with Deco silver trim over antique mirror. But the two completely different looks have one thing in common: They're simply stunning. Meanwhile, the poster bed takes a different decorative tack, though it is equally dramatic. 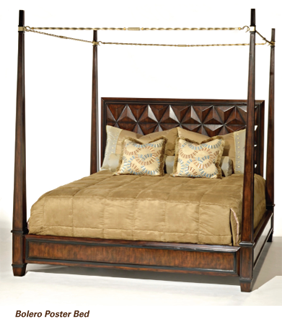 With a faceted marquetry headboard, the four-poster - being shown in a deep "Havana" finish with ebony trim - is more architectural in style, and impressive with its 94-inch-high posts. And the show-stopping pieces don't stop there. A variety of glass-top accent tables - including an oval cocktail and a demilune console - echo the cracked ice-like pattern on the aprons; this time, however, they're translated in metal with two-tone leaf finishes. 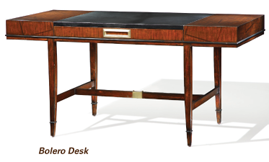 There's also a very architectural desk; with a rectangular top made of straight-grain ash with walnut inlay, set squarely on four tapered legs, its distinct get-down-to-business attitude is interpreted in the most stylish of ways. The Bolero Collection even addresses everyday needs; two distinctly different TV consoles accommodate 70-inch flat screens, both with ample door storage below.  The lower profile version is just 24 inches high, while the other - its four doors finished in a rich ivory suede - is up on legs, standing 26Â½ inches high. But it's the attention to detail that is always the hallmark of Marge Carson style, especially apparent in this group's contemporary console table. Beautifully marrying fashion and function, the straight-grain ash top is supported by a metal base reminiscent of elegant calligraphy, piercing the tabletop at one end for added emphasis. Likewise, something as seemingly simply as a nightstand becomes a work of art in its own right, combining "Bombay" and "Deco Silver" finishes, and underscored by twisted-metal stretchers. Those touches of gold, in fact, exemplify how Marge Carson is always on top of current trends. "Gold and, specifically, gold jewelry has made a resurgence in the world of fashion," Rendino says. "On this piece, the brass hardware is very jewelry-like, as are the twisted 'strands' below." Founded in 1947, Marge Carson, Inc. is one of the world's premier manufacturers of high-end residential furnishings, including upholstery, case goods, occasional pieces and decorative accessories. With more than 55 finishes and 600-plus fabrics, embellishments and leathers to choose from, Marge Carson is known for completely customizable pieces. Marge Carson's 29,000-square-foot showroom is located at 121 N. Hamilton St., High Point, NC.